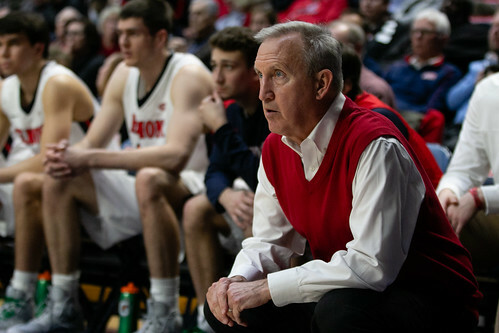 With the Belmont men’s basketball team’s 99-58 victory over Eastern Illinois University on Thursday night, head coach Rick Byrd reached another milestone, picking up his 800th career win. Still, Byrd isn’t concerned about his personal triumphs. His focus continues to be on the players he works with everyday. “I think college basketball and college athletics is about the student athletes more than it is the coaches,” said Byrd. Following Thursday’s victory, the 65-year-old coach in his 33rd season was most pleased with how his team performed on defense. The Belmont defense did have one of its best performances all season, only allowing 7 three’s and 8 points on turnovers. The team’s offense did pretty well too, shooting 51 percent from the arch. Seven Belmont players hit at least one 3-pointer. Freshman Nick Muszynski was not one of those players, but he flourished inside the paint. Muszynski scored 18 points and picked up 5 rebounds. The freshman superstar also contributed to Belmont’s strong defense with 2 blocks. Senior Dylan Windler added to his OVC MVP argument, dropping 22 points and 7 rebounds. Windler is currently averaging 20 points per game and 10 rebounds per game with only three games left in the regular season. Windler knew how big this achievement was for Byrd and wanted to make sure he did what he could to make it happen. “When I figured out about it, it added a little bit of extra motivation for us. It made us play hard, and I think it payed off,” said Windler. Byrd is currently one of five active head coaches to reach 800 wins and one of 12 all-time coaches. Though these numbers are hall of fame worthy, Byrd says they mean more to his loved ones than to him. “I’ve had so much support personally the whole time i’ve been here that, again, this kind of thing means sort of more to me for those people that have been there a long time,” Byrd said. The Bruins still have work to do with three more games left in the season. The team also has a shot to secure the top seed in the conference tournament. Like any other day, this is still Byrd’s top priority. He is more concerned about facing Southern Illinois University Edwardsville on Saturday in the Curb at 5 p.m. than any personal award, no matter how it changes the history books.